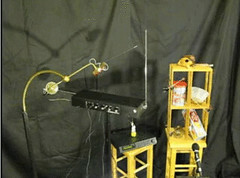 Our friend Ranjit over at Moonmilk.com has a video of Lev, a robotically played theramin, and Thumpbot which is essentially a solenoid played gathering of things not normally used as percussion instruments, playing Crazy by Gnarls Barkley. Poke around a bit and you'll find them playing Patsy Cline's version of Crazy too. Anyway, loads of fun was had. Loads of stuff was shared and learned. People liked what they saw. We can't wait until next year. 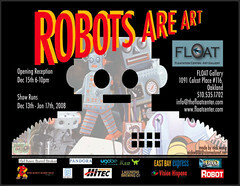 The Float Center Gallery is running a show called Robots Are Art until January 17th. Works on display from 15 or so artists - sculpture, painting, and mixed-media works. Artists include Cheryl Finfrock, Camp Peavy, Mike Wilder, Willy Matsuno, Max Chandler, Paul Gibson, Mark Murry, Scott Wiley, Liz Mamorskey, James Lovekin, Paul Baker, Nemo Gould, Al Honig & Dr. Johnathan Foote, Mark Galt, Frank Garvey, and yours truly CTP. Follow the link for details, hours, and directions. 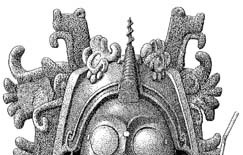 Nemo's got some new stuff up on his site...very cool stuff, as always. The piece pictured here is called "Eureka". We took a couple of years off, simply put. But the time seems right for KineticWorld to get back on the web. So here we are. 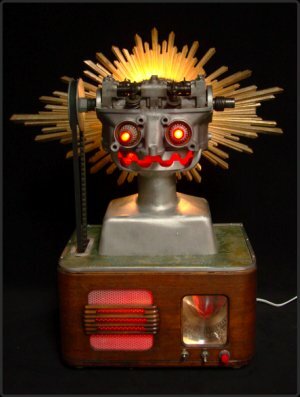 News and info about kinetic art, electronic art, time-based art, physical computing, and anything else we feel like, frankly. Thnaks for coming to take a look.